My favorite wedding role was that of a clamper. Let me explain. Last September two very good friends of mine got married. With my wife being a fine artist and me a designer, we’re often known as a creative couple. And so are these newlyweds. He’s a designer, she’s a photographer—and all-around maker of cool things. They have a recognizable style all their own. So there was an air of anticipation when it came to their wedding. I was asked to help prepare one of the elements of their wedding: the wedding vows. They received pre-engagement counseling (yes, you heard that right) from the same church and person from which my wife and I received pre-engagement counseling. So we all heard the same analogy. Marriage is like two pieces of wood that are glued together. Yes, you can tear them apart, but the wood is going to splinter. It’s a sobering and accurate illustration—and one our friends decided to use in their ceremony. He acquired two blocks of wood. I was then asked to use a wood burner to burn their vows onto the wood, one on each block. That was the plan, and one I agreed to. But after receiving the vows, I learned they also wanted the vows to be specially designed. Agreeing that was a good idea, I launched Illustrator and came up with layouts for each vow I was rather proud of. Each vow was similar in structure and so I was able to use complementary elements and type treatments between the two vows. However in designing the text, I ended up with all sizes—some text being very tiny. Not only was there not enough time to wood burn these designs, but they could end up looking bad, especially given my limited set of burning tools. So I suggested a paper transfer instead. And that’s the route we took. 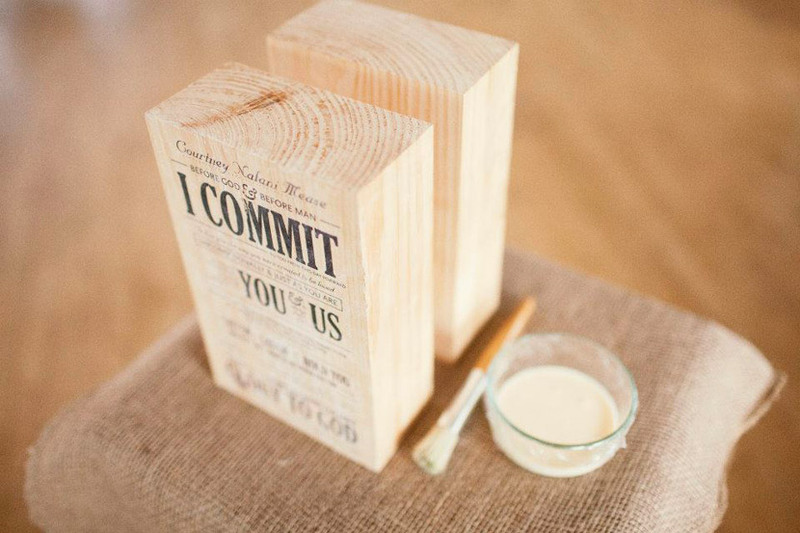 The blocks of wood with the vows on them were placed side by side, ready to be glued together by the bride and the groom. The concept is simple. Get a laser print of your design, making sure it is printed reversed. Place a layer of acrylic gel medium across the block of wood and lay your print (toner side down) onto the gel. Use a brayer to press the paper evenly across the gelled surface. Let it dry overnight, then remove the paper by wetting it and rubbing it away. The rubbing is a multi-stage process. It can also be troublesome. Certain portions of your image will likely pull off along with the paper. This can be because of the amount of gel medium you used, it could be that your wood was too rough in spots—it could be any number of reasons. This is not a big problem if you’re transferring a photo. A little toner lifting here and there adds a nice weathered feel to the piece. But when you’re transferring text, it can make portions unreadable. And while I did experience some lifting, it wasn’t too bad. So I was the clamper. During the ceremony they had a glass bowl containing wood glue. Using a brush, they each applied glue to the backs of their blocks. I then clamped their two pieces together, back to back, making sure the alignment was correct. 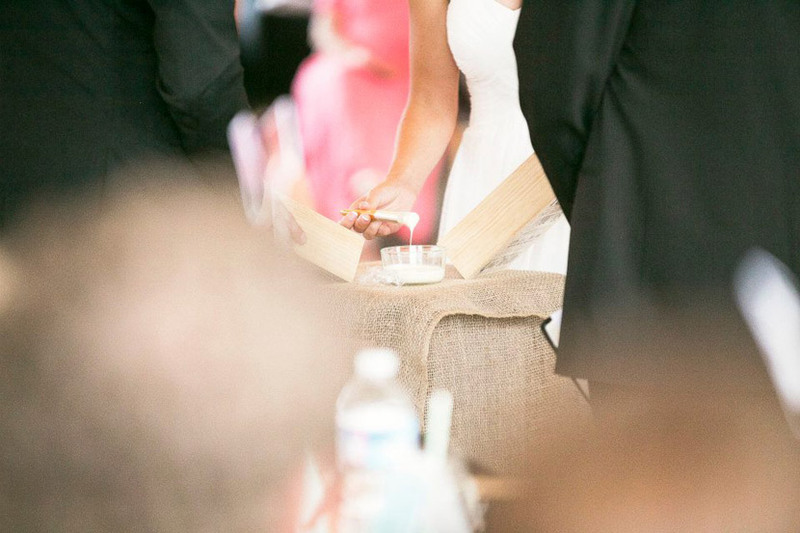 Using a brush, the bride and groom took turns applying wood glue to the backs of their wedding vows. I should mention that their ceremony was amazing. It had many nice moments and elements, included a postcard guest book, a live rap performance, amazing color choices, and a sweet venue. May their love never splinter. I’d really like to read their vows… looking for ideas to write our own this August and I love what I am able to read from these photos. Do you have copies? Hi Alisha. I’d love to help you out, but the couple wanted the vows to remain private. Many great examples out there, though… best wishes!